Leonardo da Vinci once said “Simplicity is the ultimate sophistication” and we think that perfectly describes our 3-Ingredient Keto Mocha Chia Pudding. With just 3 key ingredients, you can make this incredibly flavorful treat. 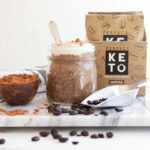 The richness of the Perfect Keto ‘Mocha’ Instant Keto Coffee blends beautifully with the milk and surrounds the chia seeds to assembly this delightful delicacy. This nutrient-dense chia seed pudding is flavored with our Perfect Keto ‘Mocha’ Instant Keto Coffee, which is a special blend of organic spray-dried coffee, MCT oil powder (medium chain triglyceride oil powder), a dusting of cocoa, and stevia leaf extract. Each packet of our Perfect Keto Instant Coffee rings in at 80 calories and 7 grams of fat. Paired with protein-packed chia seeds and some unsweetened, full-fat coconut milk or almond milk and you’ve got yourself a match made in keto heaven. What’s so great about this recipe is its simplicity and versatility. Whether you crave it for a grab-and-go breakfast or a savory dessert, by prepping it ahead of time you can enjoy this treat anytime of day. Even if you’re not following the ketogenic diet, we’re certain this will become a staple in your household. Chia seeds contain ALA (alpha-lipoic acid), which is an omega-3 fatty acid that our body doesn’t produce on its own. We convert ALA to EPA (eicosapentaenoic acid) and DHA (docosahexaenoic acid), but usually this is a slow process, unless you’re consuming foods that are rich in ALA (like chia seeds). But what does this mean for the brain? Studies have shown that there are strong links between consuming omega-3 fatty acids and brain health. One study in particular discussed the benefits of omega-3 fatty acids in conjunction with those suffering from mental health disorders, such as bipolar disorder and depression [*]. Since our gut is our second brain and our brain consists of fatty acids, it makes sense that MCTs provide our brain and body with the energy it needs to thrive. They provide support to the central nervous system, which is directly linked to brain health. Chia seeds are able to absorb 10 times the amount they weigh and pack a punch in the fiber department, with 11 grams per serving. Consuming chia seeds regularly will help keep you hydrated, fuller for longer amounts of time (helping curb those non-keto sugar cravings), and regular. Literally. When your brain gets a boost, you’re whole body follows suit. MCTs are easily digested and instantly used for fuel by making ketones readily available for the body to use. And if ketones are readily available, ketosis is achieved sooner rather than later, which is what you want when following the ketogenic diet. Coffee contains antioxidants and boosts your energy and concentration with a lovely dose of caffeine. Studies have also shown that coffee improves alertness, as well as physical endurance and performance in simulated conditions [*]. Add chia seeds, milk, and instant coffee to a small bowl or mason jar. Stir well to combine. Adjust sweetness if needed by adding stevia or keto friendly sweetener to taste. Place in fridge for 2-3 hours or preferably overnight to thicken. Stir and serve. Top with cacao nibs, sugar free chocolate chips, and/or unsweetened/plain/low carb yogurt if desired.